Defending champion Rafael Nadal advanced to the fourth round of the Australian Open with a 6-4 6-2 2-6 7-5 win over German Philipp Kohlschreiber. The second seed's serve was put under pressure and he needed some inventive shots to win in three-and-a-half hours. Fourth seed Juan Martin del Potro survived some anxious moments before beating the unseeded Florian Mayer. The 21-year-old US Open champion served 11 aces but was guilty of 46 unforced errors in a 6-3 0-6 6-4 7-5 victory. Nadal extended his record against Kohlschreiber to 5-0 but it was their closest match to date, and in statistical terms only eight points separated them over the 38 games. "Well, the most important thing is I won, so I'm happy for that," the 22-year-old said. "I am less happy about my game, what I was practising. But everybody has not very good days. "I think I played much better the fourth set. The second set for a few moments I played well, too. But the first set and the third, I played bad and I need to play a little bit more aggressive for my next match." That will be against the gargantuan Croatian Ivo Karlovic, who beat compatriot Ivan Ljubicic 6-3 3-6 6-3 7-6. 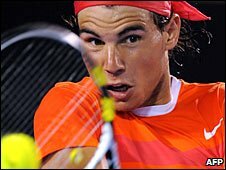 "He's always a really difficult opponent because the match is decided on a few points," said Nadal, who has won both his previous matches against the 6ft 10" Karlovic. "So the thing is to be very concentrated with my serve all the time and try to convert the small opportunities that I have on the return. That's it." It was another hard-fought victory for Del Potro, who will face Marin Cilic in the fourth round, after the Croatian beat Stanislas Wawrinka of Switzerland 4-6 6-4 6-3 6-3. Del Potro needed four sets to get past American Michael Russell in the opening round and five to overcome another American James Blake in the second. Having beaten Mayer in straight sets in the second round at last year's Championship, he found him a much tougher proposition this time, and was only 118-117 ahead on total points won. Mayer took all three of his break point chances to win the second set to love in only 28 minutes before Del Potro clinched the match following two keenly-contested closing sets. "Especially in the second set, I felt very confused with my game," he admitted. "But I improved a little bit and in the end I finished the match playing some very good points." Giant American John Isner secured a fourth-round match against Britain's Andy Murray after a gruelling 6-1 4-6 7-6 (7-4) 7-6 (7-5) victory over 12th seed Gael Monfils. The towering 6ft 9" 24-year-old was given the last seeding for the tournament after Frenchman Gilles Simon withdrew. It was therefore regarded as a shock defeat on paper, but Isner, who had won two of his three previous matches with Monfils, fired 26 aces and hit 73 winners. "I was just kind of riding a wave of momentum, and I still am," he said. Isner won his first ATP title last week at the Auckland Open and said: "I've worked hard in the off season, I know that much. I put in the time so I guess I kind of deserve to be where I am now." The North Carolinan has now served a total of 81 aces in the tournament but insisted there was more to his game than a powerful serve. "Just the way I won that match and kind of the stage I won it on, it showed me that I belonged in the top 20 players of the game," he said. "I'm really proud of how I played in the clutch moments. I kept coming forward. I played to win. Kind of forced the issue in those two tiebreakers. I was real proud of that." Isner beat Andy Roddick in a fifth-set tie-break at last year's US Open and said: "After beating him there, there's nobody I'm scared to play. If I play my game and I play well, I like to think I can beat anybody." Roddick, four times a semi-finalist in this event, set up a fourth-round tie with 2007 finalist Fernando Gonzalez with a 6-7 (4-7) 6-4 6-4 7-6 (7-3) victory against tenacious Spaniard Feliciano Lopez. Roddick, who has an 8-3 career advantage over Gonzalez, won in straight sets the last time they met in the round of 16 at the 2008 US Open. Gonzalez, supported by a throng of exuberant, flag-waving Chilean fans on Show Court Two, beat Evgeny Korolev of Kazakhstan, who likened the experience to being at a football match, 6-7 (5-7), 6-3, 1-6, 6-3, 6-4. "It was exciting to play in front of this crowd ... big support far away from home," said Gonzalez.